Bishop Paul is pleased to announce the appointment of the Reverend Dr Richard Frith as Canon Precentor (Residentiary Canon) for the Cathedral and Parish Church of the Blessed Virgin Mary, Southwell. 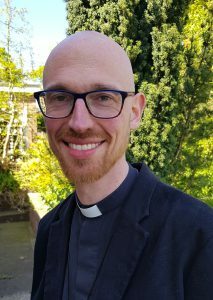 Richard is presently Vicar of Holy Trinity and St Jude Church in Halifax, an ethnically-diverse suburban parish within the Diocese of Leeds. He served his curacy with St. Mary Magdalen Church, Oxford and prior to ordination worked as a Publishing Editor. Richard’s ministry has been shaped by teaching and developing Christian discipleship particularly with children and families, accessible liturgical worship and a deep love of the choral tradition. Richard is married to Emma and they have an 11-year old son, Stephen. Richard will be licensed in Southwell Minster on 8th September 2019.